Ask fellow campers about "Gilgal Oasis RV Park" and nearby attractions. This is a very clean well maintained park with a professional pleasant staff. The sites are fairly wide and just long enough, but the park feels jammed. I do not think it would be possible given the space to get one more rv site in that area. Because of the tightness and the way it is designed if our neighbor had not left early in the morning we would have had to back out of our pull thru. But if that does not bother you then you will love this clean well organized park. Asphalt pads and streets with grass trimed by gravel in between units. All the utilities worked and are well placed. It is a very popular park and reservations should be made well in advance, we will return if in the area again. We camped at Gilgal Oasis RV Park in a Motorhome. A day trip to Victoria via Port Angles is a blast. The restaurant at John Wayne harbor is excellent and of course the lavender fields are beautiful. There is so much to do a week will barely get it done. 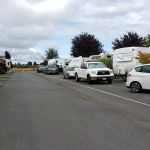 This is probably one of the quietest RV parks we've ever stayed at! It was super clean and the staff was extremely friendly. It is a small park so if you have a 40' or larger rig best to make sure you let them know and they'll put you on the outside ring where it is easier to get in and out. There are smaller type trees or bushes between each site...I think we had a lovely smaller tree on one side and definitely a lilac bush on the other. Parking was available for the tow vehicle right in front of the coach. We camped at Gilgal Oasis RV Park in a Motorhome. There is outstanding shopping just walking the main streets of Sequim! We visited the Dungeness Spit which is gorgeous at any time of the day, even in the rain. From the RV park it is easy to navigate to the Olympic bike/hike trail - we did 10 mile bike rides every day!! 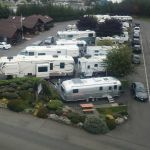 Gilgal Oasis RV Park on Sequim, WA is a really good RV park. The spaces appear to be about 45' long with parking in front of the spaces. There is room to park one vehicle per space. The space has a concrete pad and gravel area around hookups. Passenger side of space is mostly grass with a picnic table over gravel. Each site has full hookups. Satellite friendly. Wifi is maybe the best we have encountered at any park. It has plenty of capacity and is reliable. We stayed there in a motorhome. We camped at Gilgal Oasis RV Park in a Motorhome. Awesome park - small but super nice - we were in space 18 in a 43' motor home and it was the best! Felt like home away from home. Staff was very helpful and friendly - we were there for 6 nights. Would definitely stay here again if we are in the area. 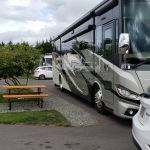 We camped at Gilgal Oasis RV Park in a Motorhome. Very nice little park. It was a little close maneuvering for our 45' MH but we've had much worse! Sites are very close together. Hosts are doing an awesome job as place was absolutely immaculate! Nice folks. Recycling on site (no glass). Good walking in the field to the west for dogs. Dog park is small but well cared for. Very convenient to town. Satellite hook up no problem and strong Verizon signal. Wifi was one of the best we've encountered. We stayed two weeks and would absolutely go back! Jack pads are required. We camped at Gilgal Oasis RV Park in a Motorhome. I'll call this a 'compact' campground. 28 sites in 2 rows. Tight turning in for a big rig. Good utilities and WiFi. Some grass between sites. Close to downtown Sequim with cute shops, restaurants and a farmers market on Saturday. A bit pricey. We camped at Gilgal Oasis RV Park in a Motorhome. Great little park. Very clean. Not many spaces. 11 pull throughs for big rigs and 17 back ins. All hook ups in a good location. A little off level from left to right, but no big deal. Grocery accross the street, city dog park 2 minutes away. Easy access to the Olympic trail for biking. If you a big, I recommend taking either the Washington Stree exit off 101 heading West, or the River Road exit heading East and then right on Washington St. If you take Sequim Ave and go North to Washington, the right turn will be tough if Westbound traffic on Washington is in their left turn lane. We camped at Gilgal Oasis RV Park in a Motorhome. This is a very nice park. It's restrooms, laundry and grounds are super clean. The location is just at the edge of town, an easy bike ride to the town center. The owners are very friendly. We would highly recommend this park to you. We camped at Gilgal Oasis RV Park in a Travel Trailer. Beautiful park. Immaculately maintained. Paved pads, grassy area and picnic table for each site. Parallel parking for towed vehicle in front of each site. Staff is extremely friendly and helpful. Only negatives would be no shade and sites are very close together. We camped at Gilgal Oasis RV Park in a Motorhome. Very close to town and many conveniences. Smallish campsites but with beautiful lawn, picnic table and tree! The WiFi was excellent and reliable. This place was charming and the nicest we have been to all summer. I'm sorry we couldn't try longer but we hadn't made advance reservations, and it's a holiday weekend. We are still waiting for the sun and view of the Olympics to appear! I'm sure it will happen soon and be spectacular! We camped at Gilgal Oasis RV Park in a Travel Trailer. I stayed in a pull-thru, site 27 with a 38' motorhome. The site was large enough for my RV and slides. Each site has a patch of grass, a picnic table, and hook-ups are surrounded by gray gravel. Pads are blacktop and mostly level. Each site has additional space for your tow vehicle. The staff are very friendly and helpful. You are greeted when you arrive, you are told your site number, and are assisted in parking in your spot. The clean laundry has 4 washers and 2 dryers, and it costs $1.5o for each machine. There's an ironing board and iron available and a wash tub in the laundry room with books, a table and chairs. This is the second time I've stayed and I really enjoy this park and the location, which is very close to downtown, Costco, Safeway, WalMart, Ross and Discount Tires. The dog area is tiny, but they have a large firepit ring and seating area. There's a small sign directing you into the park. You don't pull into the driveway next to the office, but the driveway behind the pull-thru sites. I was a little confused and circled the park. We camped at Gilgal Oasis RV Park in a Motorhome. If you want to make the 30 minute drive to Port Angeles, Kokopelli's on Front Street is an excellent restaurant with fresh seafood and a view of the strait. Michael's Seafood on First Street is also excellent, but the décor is a little outdated. If you're in the mood for Italian, Bella Italia on First Street is also very good. This is a wonderful, unique, clean quiet and centrally located park. The owners are new and are committed to building on the outstanding service and customer oriented service established by the previous owners. The park is small in terms of the number of sites and compact, but nicely landscaped, and immaculately maintained. If you are looking for a quiet and conveniently located park then you will love this park. We were here for several months and loved our stay and the wonderful people we enjoyed while there. The owners live on site and are friendly and customer focused. One of the best parks we have stayed in. We camped at Gilgal Oasis RV Park in a Fifth Wheel. Don't miss the areas lavender farms. Hurricane ridge and the rain forest are wonderful day trips. This is a very nice park! Yes, sites are close but everything is so neat and well kept. Bathrooms are spotless. Laundry is $1.50 per wash and dry. Good Wifi as well. It's behind a hotel on the main road but very little road noise (if any). Cost reflects a combo of one night at Passport America rate and one night at Good Sam rate. I'd stay here at full cost too. We camped at Gilgal Oasis RV Park in a Travel Trailer. Sequim has WalMart and Safeway for groceries. We got the last space available in the park and was for up to 34' rigs, our 33'11" fifth wheel fit fine. Appears to be a lot of full timers but the park is neat and clean and close to shopping and other services. Spaces are very close together and hookups are at the end of the sight but was manageable. Good place to explore the Olympic Peninsula. We camped at Gilgal Oasis RV Park in a Fifth Wheel. Nice little park. Well maintained. Asphalt roads and sites. Gravel and grass strips between site. Hooks ups worked. WiFi streamed Netflix! Showers were clean with plenty of hot water. The park is set back just far enough from the highway so traffic noise is mostly unnoticeable. 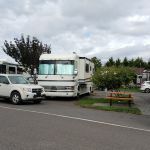 We camped at Gilgal Oasis RV Park in a Motorhome. Visit Port Angeles and take a whale watching out of Port Angeles to see killer whales. Take a day trip to see The Olympic Peninsula National Park. Visit Port Townsend. We found the cheapest diesel is across the street from the Park. The John Wayne Marina was lovely and worth a visit. We ate twice at The Oak Table restaurant in town; very friendly staff and delicious food. Lots to do in the area. Olympic mountains in Port Angeles, Port Townsend great farmers market. Squim has lavender farms and a cute down town. Alder Wood Bistro has excellent food and locally sourced ingredients. Open for lunch and dinner (but not continuous hours) and depending on the time you may need to wait. Stayed here to visit Olympic National Park. Also went to Port Townsend which was very nice. Ate at the Black Bear Diner, and it was very good. It is a relatively short walk to town and a very short one to a grocery store. No a kid friendly park, as there are no facilities for them. Tip: look for The Emerald on the alley off the main street, great beer and good food. We came for the Olympic Bird Festival and found excellent birding in the area, especially Dungeness Bay, where we saw lots of bald eagles. The park is in a slightly run down part of town, though we never felt vulnerable. The town of Sequim has everything you'd ever need: Safeway, Costco, Grocery Outlet. We thought Westside Pizza was quite good. Take the ferry in Port Angeles to Victoria BC. and visit the Buschard Gardens and town. Plan for a full day. Sequim is a very pretty town. Dungeness spit is beautiful and for the keeners, an 11 miles hike. There is all the usual stores and Quality Foods is across the street. 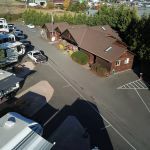 Are you affiliated with Gilgal Oasis RV Park ?